Chocolate Mint Squares are a delicious mixture of textures and flavors. 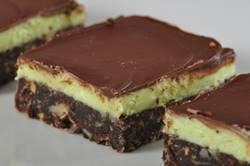 They are No Bake, have three layers, and are actually a mint flavored Nanaimo Bar. They start with a crumb base, followed by a layer of mint flavored buttercream, and the crowning glory is a smooth and glossy layer of dark chocolate. The important thing to remember when making these Squares is that each layer does need to be chilled before adding the next layer. A few notes on ingredients. When you make the bottom layer, you can use either graham cracker crumbs or crushed digestive biscuits. For the unsweetened cocoa powder you can use regular unsweetened or Dutch-processed. The dried coconut can be sweetened or unsweetened and you can use flaked or shredded. (Sweetened coconut is made by combining coconut with powdered sugar and is packaged either in plastic bags or cans.) For the finely chopped nuts, you can use walnuts, pecans, almonds, or even hazelnuts. When making the mint buttercream you can use either pure peppermint extract or peppermint oil. Peppermint Oil has a much stronger and more concentrated flavor than peppermint extract so you need only half the amount to obtain that deliciously cool and refreshing mint flavor. (I used LorAnn Peppermint Oil.) I have colored this layer green so everyone knows they are mint flavored. Again, this layer needs to be chilled before we add the shiny coating of chocolate. I like to use a good quality dark chocolate, one that has a lovely shiny finish (a sign that the chocolate was cooked at the right temperature for the right amount of time) and wonderful 'snap' when you break it into pieces. Chocolate Mint Squares: Butter, or spray with a non stick cooking spray, a 9 inch (23 cm) square baking pan. Line the pan with parchment paper, wax paper, or aluminum foil. Crumb Base: In a saucepan, over low heat, melt the butter. Stir in the sugar and cocoa powder. Take the saucepan off the heat and gradually whisk in the beaten egg. Return the saucepan to the heat, and cook over low heat, stirring constantly, until the mixture thickens (1 - 2 minutes). Remove from heat and stir in the vanilla extract, graham cracker crumbs, coconut, and chopped nuts. Press the mixture evenly into the prepared pan. Cover and refrigerate until firm (about an hour). Mint Buttercream: In your electric stand mixer, fitted with the paddle attachment (or with a hand mixer), beat the butter until smooth. Beat in the remaining ingredients. If desired, add a little green food coloring and beat until the filling is uniform in color. If the mixture is too thick to spread, add a little more milk. Spread the filling over the bottom layer, cover, and refrigerate until firm (about 30 minutes). Chocolate Topping: In a heatproof bowl, placed over a saucepan of simmering water, melt the chocolate and butter. Let cool to lukewarm, and then spread over the filling and refrigerate just until the chocolate has set (5-10 minutes). To Serve: To prevent the chocolate from cracking bring the squares to room temperature and then, using a sharp knife, cut into pieces. Yield: Makes about 36 squares. Preparation time one hour.